Come, stay with us around the boundless ocean and sink into the most blissful comforts of our rooms with contemporary aesthetics. A vacation that feels as good as it sounds awaits you. Cinnamon Bey Beruwala is a food-lover’s paradise. So make sure you savour our elaborate dining experiences, while you go about exploring the art, architecture and nature around this little town. A beauteous resort with chic, contemporary décor, serving the most delish food, located right by the sea – isn’t it simply the best match for your idea of a splendid destination wedding? Take a peek at the tasteful ambience that awaits you, right by the sea. Where do you fancy taking vows – in a classic indoor banquet hall with a large open terrace, or a sprawling garden that overlooks the boundless ocean? If you’re a more private person, our restaurant with gazebos in the garden will cater to your needs. We lay out a sumptuous spread of the most delightful local and international cuisines, so that you and your guests can truly relish the wonderful occasion. From delish appetisers, to a rich main course, to divine desserts, all of it ensure, your wedding leaves an aftertaste that is fondly remembered for years to come. Mere words are not enough to express how thankful I am to the Cinnamon team for making my wedding day one of the best days of my life. Make the most special day of your life an unforgettable experience. 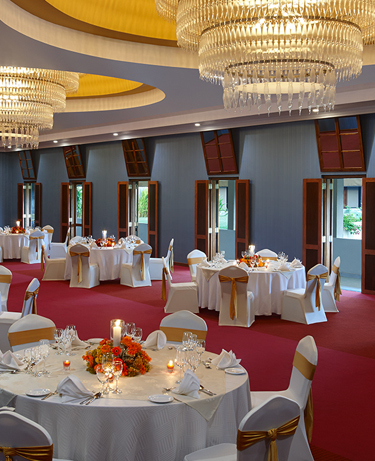 Host this special occasion with extravagance by choosing a package that meets your requirements. Feel the lovely ocean breeze infuse absolute bliss into your special moments at our lush gardens. We could also put up a marquee if you wish.